Mike Sackett, Executive Director, Jim Hayman, Director, Business Development, and Sandie Minguez, led the CGNA Group as it reviewed and celebrated 35 years of continuous success, development, and innovation. Representatives from 46 of North America’s top distributors met at the luxuriant Paséa Hotel & Spa on the Water in Huntington Beach, California, to set CGNA’s strategic direction for the future in motion. 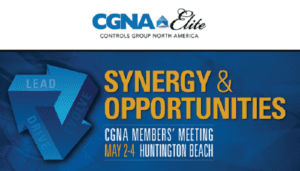 CGNA has charted a new course for its future, and to emphasize its initiative, presented Keynote speaker, Jim Young, CEO and Co-Founder of RealComm|IBCON, who delivered a unique and appropriate state of the union address for the Smart Building industry. More ControlTrends video coverage to follow.